Meal times with the family can always be messy, and keeping the house straight is a never ending battle! This is the case for most families with small children, how mess can suddenly appear because something has been knocked over or spilt causing a mess, and a slip hazard on the floor. Tenura understand the constant work parents have to put in to keep the house neat and tidy, so we have come up with a material designed to reduce the risk of spills and keep areas clean. Anti slip anti microbial childrens mats can create an excellent non slip surface at home or on the go, this material helps to reduce the risk of many spills, breakages and a mess on the table or floor. Tenura mats can be applied to any surface with ease, by laying it down on a flat, dry surface, the silicones natural properties will adhere it to the surface, and upon removal it will leave no residue at all. Tenura children’s mats have been created in a fun green frog or orange cat design, to make meal and play times more fun and enjoyable for children. Tenura children’s anti slip mats also offer a strong anti-microbial protection, helping to stop a wide range of bacteria from manifesting on these mats. This helps to protect your children’s developing immune systems and will help to stop any nasty build-up of bacteria or dirt. Tenura anti slip children’s mats are also very easy to wash, with a simple cleaning method of soap and hot water, you can be sure that this material is so clean you could eat your dinner off it, and once dry again, will provide the same level of slip prevention. We think this material is a cost effective solution to common dinner mats which can cause an even more dangerous surface for foods to rest on, whereas our material is proven to help create an anti slip surface, that reduces the risk of accidents. Tenura anti slip childrens mats are available in a green frog or orange cat design, and will provide a strong non slip surface perfect for meal times! 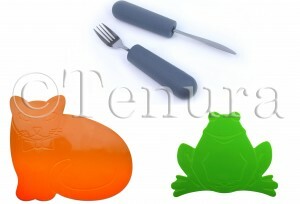 You can buy Tenura childrens mats and cutlery grips direct from the website! Posted in Arthritis Aids, Assisted Living, Daily Living Aids, Independent Living and tagged anti microbial childrens mats, anti slip childrens mats, anti slip mats, cutlery grips, tenura on 27th May 2015 .